Looking back on 2017, Transportify Philippines has a lot to be thankful for. The previous year was filled with blessings and we would like to take this opportunity to express our gratitude to all who contribute in making Transportify the best courier in the Philippines. Transportify delivery driver partners are the ones who directly and personally interact with most of our clients. How they present themselves to the clients and how they perform their courier and delivery services tasks will reflect on Transportify. We have received positive reviews from clients and business partners on how polite and responsible our drivers are, and Transportify would like to thank all of our (approximately) 6,000 delivery driver partners who work hard to give our clients quality service. Our driver partners have really been extra helpful to our business clients back in 2017, especially during the peak seasons such as the months of February, April, May, and Ber months. We also would like to express our appreciation to all Transportify clients who continue to choose our courier and delivery services. As of press time, we are proud and thankful that Transportify has reached approximately 50,000 clients who never stopped supporting and believing in us. Our clients’ continuous trust that only Transportify can handle their personal and business deliveries encourages us to improve our services further—we will do our best to keep giving fast and reliable same-day parcel deliveries. Transportify is also thankful for the new business partnerships we gained last 2017. Recently, Transportify has just become Electrolux Philippines’ third-party logistics partner or 3PL partner and even started a collaboration with Bayan Automotive Industries, Corp. These partnerships show that not only small-to-medium enterprises trust Transportify, but as well as bigger businesses. We could not express enough how grateful we are, but our valued clients and reliable delivery driver partners can count on us that we will not stop finding ways to improve Transportify’s services and logistics system. 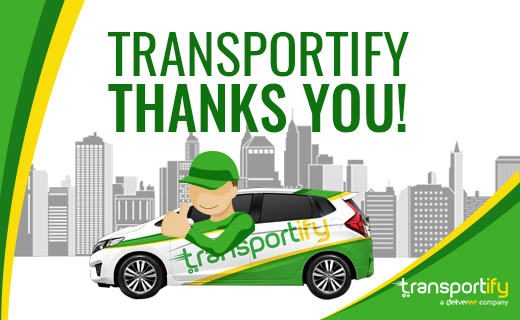 In this article, Transportify Philippines takes the opportunity to express its gratitude for the blessings the logistics company has received last 2017, from hard-working delivery drive partners, to ever-loyal clients, to new business partnerships.